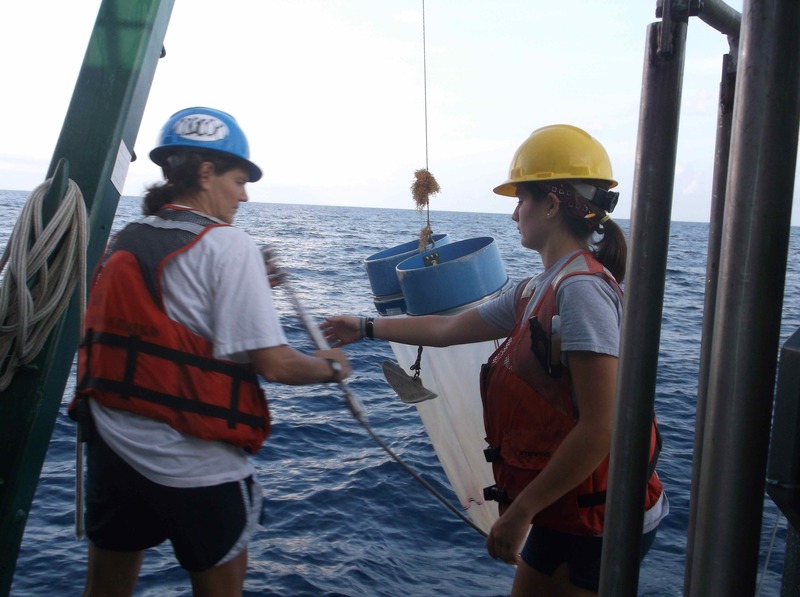 Chief Scientist Heather Broadbent and Katrina Ternus launching the bongo nets to collect plankton samples at the Deepwater Horizon oil spill site. While we still don't have the complete picture of the consequences of the spill, there are some interesting anomalies in data collected at the site. I just had an interesting conversation with Kat Ternus, one of the scientists collecting data on board. She is collecting data on the photosynthesis rates of plankton at the different sites we visit at dusk and dawn. To do this she uses a specially designed titration device that calculates oxygen levels by automatically adding a reagent to the sample. She used the device on the last cruise in May and found that while the data collected at most of the sites made sense, the sample collected at the Deepater Horizon site made the equipment “go haywire,” reporting levels of oxygen more than double the expected amount. This is a great example of how we deal with unexpected data. Some of us might first suspect the equipment- or if you are like me, assume you messed up the test! Something must be wrong with the data. Others might trust the data outright and proclaim a new discovery. Both reactions can lead you away from solid conclusions. The best option is to keep an open mind as you may have discovered something incredibly interesting, but re-test your equipment, replicate your results, and consult with colleagues. Kat said that at first she thought the device might be flawed. However, she noted that since the last cruise, she has used the device on many samples, and the data seems fine. She also consulted the creator of the machine, and he said that he had had similar odd results at the Deepwater Horizon site. So it may not be bad data after all! Does that mean that something weird is going on at the site—that there is twice as much oxygen as there should be? Maybe. Maybe not. But it raises interesting questions, and like any good scientist Kat says she is really excited to run the test again at the Deepwater Horizon site to see if there really is something weird going on! That’s real science!!!! Print article This entry was posted by greely on August 7, 2013 at 6:06 pm, and is filed under Oceanic Updates. Follow any responses to this post through RSS 2.0. You can leave a response or trackback from your own site.